Nice one… just make sure to lock it when you are not around! bikes like this, or just bikes in general, have a nasty habit of being stolen. Once, I had my bike stolen, and I was so outraged I could probably have killed the person who took it if I had been there..
Wow, One Hundred Thousand Miles – that is amazing. @Mime: Bike theft is such a pain and an old problem. I wish someone would come up with a cheap gps + cellular/satellite tracking system you could hide inside the frame. You would need to bring along some stout friends and baseball bats each time you collect it back however. Fail hack, double the weight of a normal bicycle with half the stability loaded. 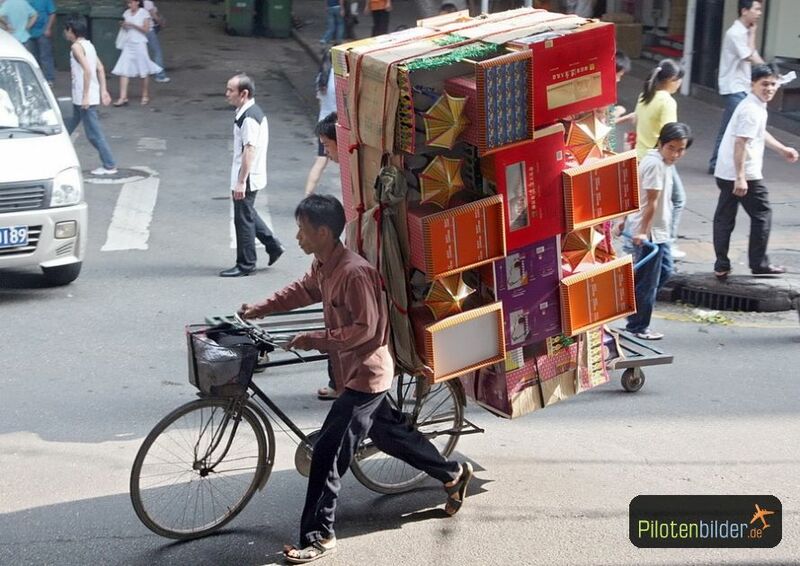 The right way to do it, is with a tricycle”, a far cheaper cargo bike, mainly used in India and East Asia countries. With 5 bikes one can built 3 tricycles. I don’t see a big stability problem with it, really. The center of gravity is pretty low, so it should be easy to handle even with quite a lot of stuff on it. eh, im usually super critical of crap posted on this website too. however i like this project. although not perfect by any means, 2 wheels offer lower rolling resistance and less probablity of a flat tire. ever tried to corner hard with a tricycle? Which style? 2 in front or 2 in rear? the former is very stable, the later not so much. It’s actually a pretty great home-built bakfiets. They’re super common in Holland. My wife used one to get a couch to our apartment in Den Haag. They’re super stable as long as you don’t go tearing around corners. They are heavy compared to a racing bike, but you really can’t beat them for hauling heavy stuff around a big city, especially someplace like Amsterdam or Den Haag where parking a truck improperly can net you a EUR 250 ticket. 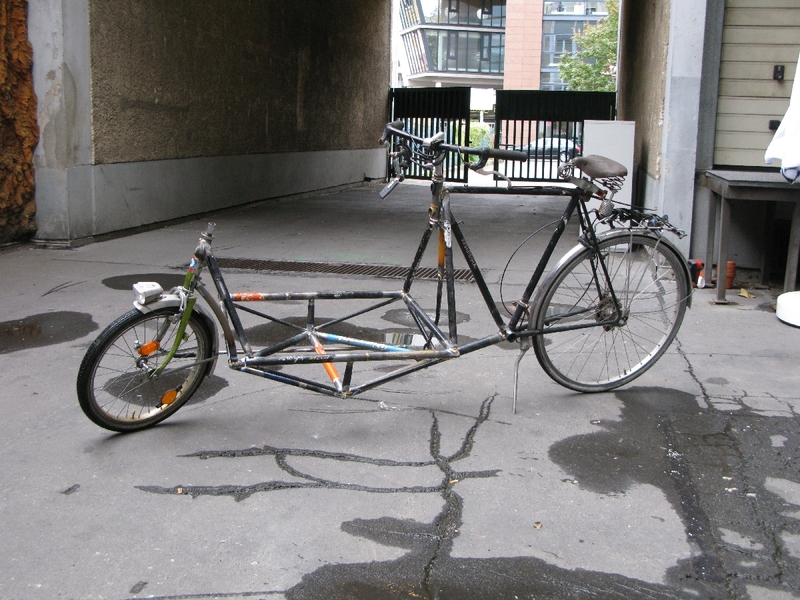 Tricycles are too wide to ride on the german bike paths in big cities. German car riders are not happy when you slow traffic with your slow and wide tricycle on the csar line. This bike makes sense. Nah, you can modify the trail to get the balance of stability/steerability that you need. Cargo bikes like this one usually have very low trail so that you can still steer when you have 100kg in there or whatever, but it means that they are twitchy to ride unladen. I tried one out with my son in (a toddler) and it was very squirrely! The problem with using trikes is that they don’t like going round corners, and you have to develop all sorts of strategies to turn without them threatening to roll. The Long John style of cargo bike as shown here is way more manoeuvrable. How have you connected the staring from the handlebars to the front wheel? It looks like he attached a rod from the end of the fork attached to the handlebars, to the front fork at the wheel, as shown in the first picture. if only i had one of these when at uni…. He forgot to beef up the brakes and kickstand. The bed on that thing could easily hold more weight than either of the previous compenents were meant to deal with. Ideally disc brakes should be added. The kickstand performs very well. 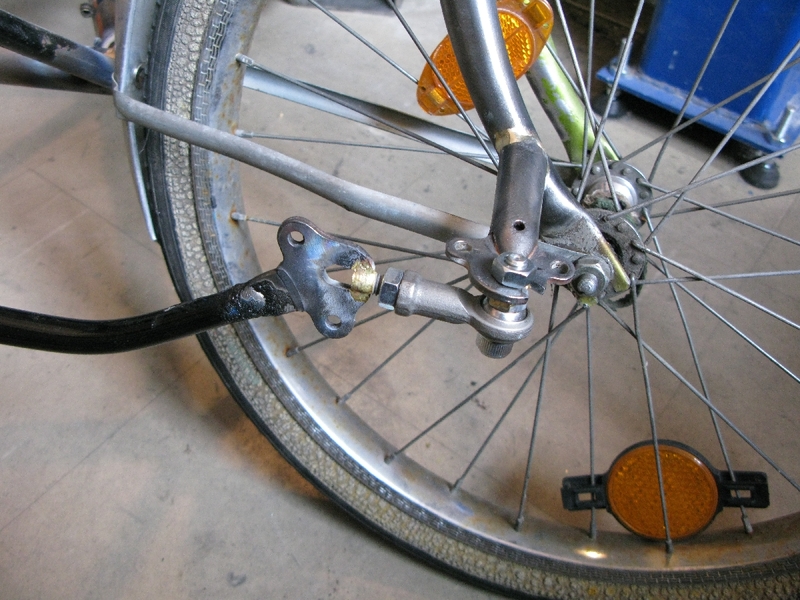 I’ll reinforce it with a steel tube to reduce bending of the square tube under heavy load (e.g. 20l gas bottle). This is my first brazing ever and I learned a lot about joining steel! The next bike will look much better ! The main intention of the project is to build a fully usable cargo bike from scratch, while self teaching some brazing and having lots of fun. I know hydraulic brakes and disk brakes will do a much better job than the old ones, but they perform quiet well. Not need to replace them, at least in almost-flat-town Berlin. Guilty: I did not visit the site, from the picture in the article it looked like the stock kick stand. I noticed the brazing too, but A) it’s probably atleast the level that I would be able to produce b) it’s doing it’s job just fine c) I’m assuming some paint and an encounter with a sander are in the bike’s near future. Looks just like a traditional danish Long John bicycle. But DIY is of course always better! Good job!